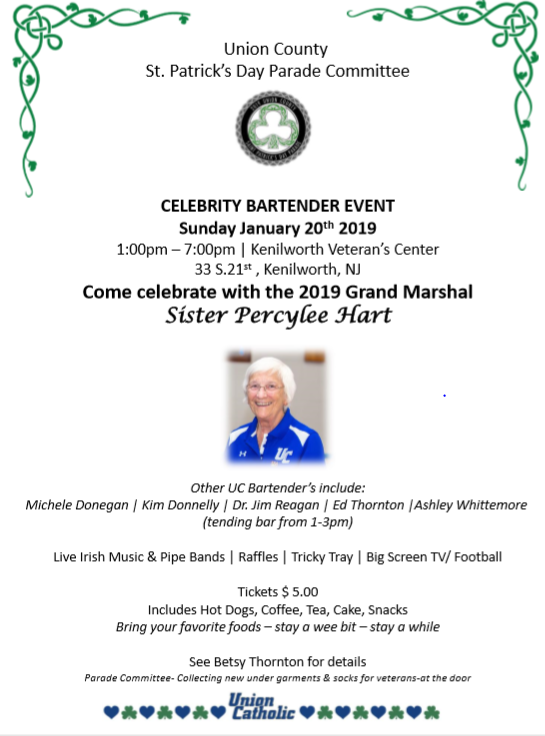 The Union County St. Patrick’s Day Parade Committee will host a fundraiser for its St. Patrick's Day Parade, which Union Catholic Principal Sister Percylee Hart, RSM is serving as the Grand Marshal, this Sunday, Jan. 20. The annual Celebrity Bartenders fundraiser will be held from 1:00 to 7:00 p.m. at the Kenilworth Veterans Center (33 South 21st St., Kenilworth, NJ). will benefit the 23rd Union County St. Patrick’s Day Parade. The parade steps off at 1 p.m. on Saturday, March 16, 2019, on Morris Avenue in Union, NJ. Entertainment will include the Celtic rock band Bloody Callán and a mass bagpipes and drums performance. Parade Committee members Marc Dowling and Katie Simon will be at the event. Tickets are $5.00 each and include coffee, tea, cake and hot dogs. Refillable commemorative mugs are $10.00. Tickets can be purchased from Mrs. Betsy Thornton in the Admissions Office or via email at bthornton@unioncatholic.org. For more information about the parade, visit www.unioncountystpatricksdayparade.com.